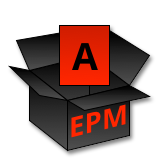 EPM also includes graphical “setup” and “uninstall” programs that can be provided with your distributions to make installation and removal of more than one package a snap. The installers can be customized with product logos, “readme” files, and click-wrap licenses as desired. EPM is provided as free software under version 2 of the GNU General Public license. Note: This software is currently in maintenance mode.